MOHAVE COUNTY, Ariz. — Breakneck agricultural development by well-heeled out-of-staters has upended conservative orthodoxy in this parched rural county. 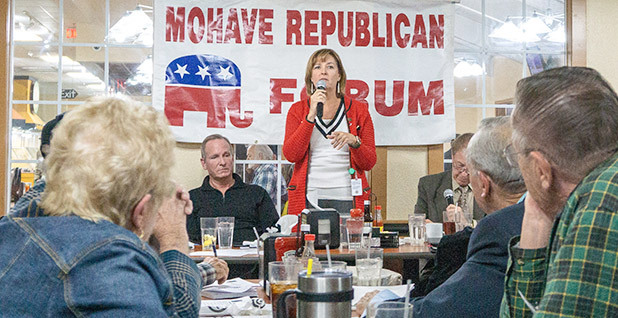 "We were the 'Land of the Free' for the longest time," state Rep. Regina Cobb (R) said recently at a Republican forum. "We wanted to be able to put wells where we wanted to. We didn't want monitoring. We didn't want metering. We didn't want government coming in and telling us what to do." "Until," she told an audience where some wore "Make America Great Again" hats, "we saw the number of wells that were being put into the ground." Seven years ago, there was virtually no farming in Mohave County. E&E News examines the West's mismanagement of groundwater, an unseen environmental disaster that threatens to send America's food system into meltdown. Click here to read more coverage. That changed in a big way when a Las Vegas real estate developer, East Coast investors and California nut farmers were lured to the area by its nonexistent groundwater regulations. They snatched up thousands of acres and poked industrial wells more than 1,000 feet into the ground. Since 2011, they've drilled at least 163 wells, according to county officials. The development drove county officials into a panic. The county seat, Kingman, relies entirely on groundwater for its population of about 30,000. Based on historical use and modeling, the city thought it had hundreds of years' worth of water in the Hualapai Valley Basin aquifers it relies upon. But the farms quadrupled the amount of water getting pulled out for agriculture, far exceeding recharge rates, according to U.S. Geological Survey estimates. "We are seeing extraordinarily steep declines," said Keith Nelson, a hydrologist with the Arizona Department of Water Resources, referring to groundwater levels. The data suggest "we basically have a groundwater mining situation," he said. That has alarmed county officials, who now wonder how much water they have left. A worst case scenario could be only 55 years, according to a recent study. "They have the capacity with the wells; they just have to turn them on," said Nick Hont, a county civil engineer. "That would be a total disaster for the city." The farms aren't doing that, yet. They dispute the county's characterization of their operations and emphasize that in Arizona, property owners have a right to the water underneath them. "It has already been well-studied and modeled," said John Gall, owner of a consulting firm that has worked with several of the farms in the area. "And approvals were given for those withdrawals." But Mohave County isn't the only part of Arizona struggling with overtapped groundwater. In neighboring La Paz County, a Saudi Arabian dairy bought an existing nearly 10,000-acre farm and planted hay for export in 2014. In Cochise County, east of Tucson, private wells are pumping up sand. It's an unexpected turn for a state that has the nation's most robust groundwater management law. The 1980 statute mandated sustainable management of the state's main aquifers. The law contained strict provisions, including a limit on irrigated acreage. 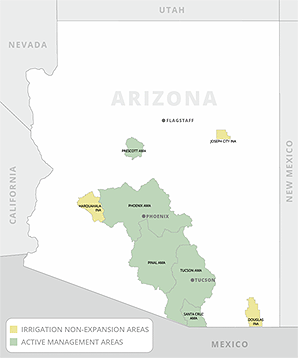 "Arizona is generally held up as the most advanced, comprehensive groundwater management system in the country," said former Interior Secretary Bruce Babbitt, who signed the law as Arizona's Democratic governor in 1980. The law does nothing for Mohave County, however. It lies outside the law's management areas, and its current predicament underscores some of the law's shortcomings. Arizona's groundwater woes also come as the state grapples with how to make do with less water. Climate change and frequent droughts are threatening the Colorado River, a principal water source for the state. If a shortage is declared on the river for the first time — a 50-50 proposition next year, according to forecasters — Arizona will be the first state to see its portion of the river's water dialed back significantly in 2020. That has led to another fear in Mohave County and other rural areas of the state: Water managers in the booming metropolitan areas of Phoenix and Tucson will come for their groundwater. All of this is starting to change attitudes toward regulation, said Scott Deeny, a veteran Arizona water attorney. "People are seeing this as 'This can protect us,' not 'This is the government coming in and telling us what to do,'" said Deeny, who now leads the Nature Conservancy's Arizona water program. Enter Cobb, 58, the determined state legislator. Cobb wrote the only water-related bill that passed the Arizona Legislature last year, a modest measure that appropriated money to study the groundwater basins in Mohave County. It's an uphill fight. A more far-reaching bill that would likely lead to well monitoring — and eventually, more regulation — failed. It was blocked by Republicans who feared it would set a precedent for far-reaching water use restrictions across the state. Cobb will try again next year. She said the rural Western mindset has to change. She's starting by trying to convince Mohave County, which backed President Trump with 73 percent of its vote in 2016, to back her efforts. "We have always wanted to be the 'Land of the Free.' We decided we didn't want any regulation," she said over lunch. "It was all fine and good until someone comes in and wants to take all of our water. They can come in and take as much as they want." This isn't Arizona's first groundwater war. Tensions between farmers, miners and growing urban areas have been boiling since the 1930s, occasionally leading to violence. In 1976, a reporter exposing fraudulent land and water sales connected to the mafia was murdered by a car bomb. Lawsuits were flying in the 1970s. A 1976 Arizona Supreme Court decision couldn't make sense of the state's groundwater rules, leading to a commission tasked with finding a compromise. Talks appeared stalled until Babbitt, who became governor in 1978, engaged in some political chicanery. Babbitt secretly convinced then-Interior Secretary Cecil Andrus to stall construction of Central Arizona Project canals that would carry water from the Colorado River to the state's population centers — infrastructure that was critical to the future of the state. The gambit worked, and after 3.5 years of negotiations, the law passed in 1980. It created Active Management Areas, or AMAs, and Irrigation Non-Expansion Areas, or INAs. They covered the parts of the state that were home to 80 percent of its population. In those areas, sustainable practices were required, meaning as much water had to be returned to the aquifers as was taken out. And it contained two landmark provisions for the covered parts of the state: It outlawed bringing new farmland into production, and it required developers to show that their projects would have a 100-year water supply. Current Arizona Department of Water Resources (ADWR) Director Tom Buschatzke said the law has been a success. Farmers at the time, he said, "traded new land for the right to continue pumping groundwater." When the groundwater law was passed, Mohave County wanted nothing to do with it. "We wanted to be the Wild, Wild West," Cobb said. "We wanted to be as free as we could possibly be." By size, Mohave County is one of the largest in the country, bigger than the states of New Hampshire, Massachusetts, Delaware and Rhode Island combined. But in 1980, hardly anyone lived here, and it featured no agriculture, so it didn't fall into the management areas protected by the law. That left it with almost no rules for managing groundwater. And that has created major problems, Cobb said. "At some point, you have to say, 'Who is going to lose in this?'" she said. Cobb is a dentist and considers herself a "commonsense Republican." One of 14 children, she's an avid hunter — with both a rifle and a bow. Before lunch, she was shoeing one of her four horses. She got a crash course in groundwater as soon as she was elected four years ago. 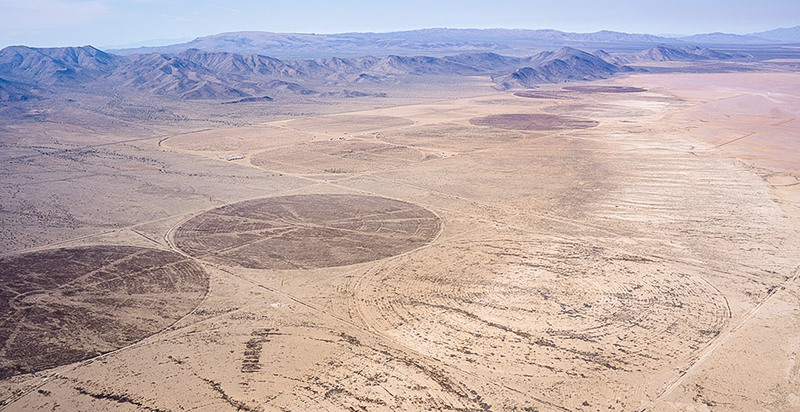 The county sits on three massive groundwater basins – in the Hualapai, Sacramento and Detrital valleys — that filled up during the most recent Ice Age. Kingman, the county seat, has relied on the Hualapai Basin for all of its water since the late 1970s. Because of that, the basin already operates at a deficit. 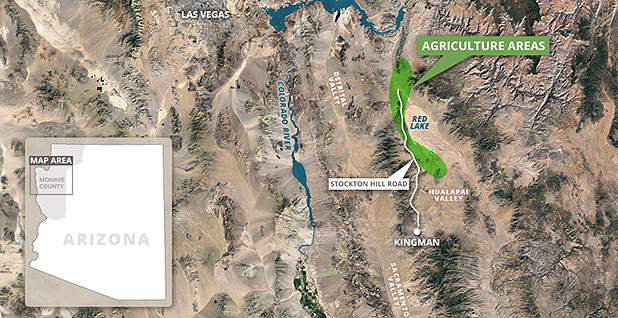 Kingman alone generally pulls about 8,000 to 8,600 acre-feet per year. County Manager Mike Hendrix said the city was comfortable depleting the aquifer at that rate because officials thought there was hundreds of years' worth of water in those aquifers. 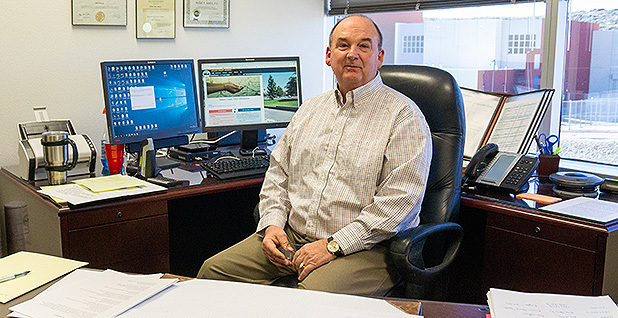 Beginning in 2002, Las Vegas real estate developer Jim Rhodes started buying more than 100,000 acres north of Kingman and on the west side of what was once Red Lake, planning to build houses. The recession scuttled those plans, but, in 2011, he shifted to agriculture and began planting Alfalfa. Stockton Hill Farms, which is operated by ACX Global, was next. ACX is owned by the United Arab Emirates-based conglomerate Al Dahra. It bills itself as the No. 1 U.S. exporter of of feed and forage products to markets in Japan, China, South Korea and the Middle East. Some California nut growers also moved in, likely motivated by California's new groundwater management law and other regulations. They included the Modesto-based Beard's Quality Nut Company. Hendrix estimates that some 70,000 acres have been purchased for agriculture in the Red Lake area, including some controlled by East Coast hedge fund investors. But because of the state's lax regulations, the companies largely operate in secret, and most refused to disclose their plans — or the amount of water they were using — to the county. Efforts to reach nearly all of these companies and investors with questions for this story were unsuccessful. County officials first became alarmed when they saw the size of the wells. Many installed industrial wells that drilled down 1,000 feet, even though the groundwater table is only about 300-700 feet down – an indication that were planning for the long haul. And they used center-pivot irrigation, which is not as efficient as drip or micro irrigation. Alarm turned to terror when an East Coast investor told the county Board of Supervisors he planned to take 70,000 acre-feet per year by 2017. Rhodes further indicated that a separate operation would pump about 20,000 acre-feet annually. That also got the attention of ADWR, the state regulator. ADWR used satellite imagery to estimate how much water was being used, based on farm size and crops planted. The agency found that in 2014, about 8,000 acre-feet of water was pumped out of the Hualapai basin for agriculture. By 2016, that had quadrupled to 32,000 acre-feet. County supervisors contracted USGS to study and model the basin. USGS's Jamie Macy is in the second year of the three-year project. He said the impact of the farms is unquestionable. "There is much greater stress on this aquifer system," Macy said. "Remember, this is all withdrawals." Hendrix said the water levels in some of the city's wells have dropped 140 to 150 feet. Hont, the county's civil engineer, said there is an easy way think of the city's water resources. If users take 8,000 acre-feet per year, you have water for 400 years. If users pump 80,000 acre-feet, you have water for 40. Farmers and their allies dispute those figures. Gall owns Arizona Land and Water Resources LLC, a consulting group that has worked with several of the farmers in the area, including, formerly, Rhodes. He said the basin has already been studied extensively. When Rhodes first invested, he was initially looking to build homes and wanted to be sure there was adequate water supply, Gall said. Due diligence then revealed he could safely take out 120,000 to 140,000 acre-feet from the basin per year, Gall said. Gall also said the county is using misleading figures. A couple years ago, there were concerns Rhodes was going to plant tens of thousands of alfalfa and nut trees after entering into a land swap with the Bureau of Land Management. That didn't happen, and several of Rhodes' farms have gone into bankruptcy and are no longer in production, Gall said. 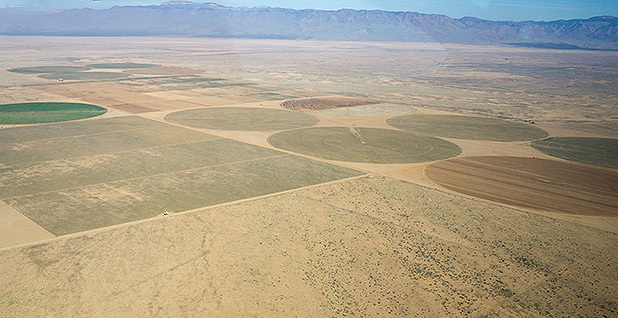 The ones that are operational — like others in the area — have largely shifted away from alfalfa to nut orchards, which consume about half as much water per acre. "The projections that were made back in 2015 were not truthful projections," he said. "They just grossly overstated potential demand." In total, Gall estimates that about 10,000 acres are in production. When pressed on the need for so many industrial wells, though, Gall pointed the finger back at the county. "That's a product of their own fear," he said. The "fear" stemmed from the county's asking ADWR to establish a new management area for Mohave County under the groundwater law in 2016. Under the law, existing operations are grandfathered in when a new area is established. So the farmers drilled — sometimes at a pace of a well per month — to secure their ability to do so in perpetuity if ADWR signed off on the county's request. It ultimately didn't come to that; ADWR refused. And their response highlighted problems with the law. Babbitt said that when the bill was passed, he envisioned that coverage would expand as the state faced new development pressures like those occurring now in Mohave County. The law created several ways to establish new management areas. The easiest was petitioning ADWR and the governor, who could essentially do so with the stroke of a pen. "In the ensuing 40 years, not a single governor of Arizona has had the courage or initiative to address the problem by invoking the law," Babbitt said. "It's really quite remarkable." The criteria for doing so in the law are minimal, boiling down to a need for management to preserve existing groundwater for future needs. "Those criteria are as clear as can be," Babbitt said. In its response to Mohave County, ADWR acknowledged that there was an overdraft in the basin and that groundwater tables were dropping 3 to 5 feet per year. Still, Buschatzke, the ADWR director, said the agency "lacks sufficient evidence" to support a new management area. ADWR also claimed the law forbids it from considering future withdrawals. "Under the relevant statute," Buschatzke wrote, "ADWR is not authorized to consider future potential increases to annual withdrawal rates within the basin for purposes of assessing whether or not to designate" a new management area. This strikes county officials as a legal paradox. The law forbids regulators from considering future withdrawals from existing, large-scale wells. But even if they established a new area, they couldn't limit their pumping because the well was already there. "It's better to think ahead, before the disaster happens," said Hont, the county's civil engineer. There are other reasons why the law doesn't help Mohave County. The goal of the law is to maintain a safe yield, balancing withdrawals with recharge. Mohave County was already at a deficit because of its minimal recharge, so safe yield wouldn't work, Hendrix said. Then there's the thorny property rights issue that has dominated groundwater issues in the West for decades. "Everybody that farms here has a right to the water underneath them," said Steve Schmidt, who manages about 300 acres east of Red Lake for a Las Vegas-based businessman, Al Barbarich. Cobb, the state legislator, said all of this is why she is proposing something different. Her first step is a DWR study of the basins that will be independently verified by a local university, such as the University of Arizona. Then she hopes to enact a rural management area that would convene the big players to come up with a local solution to the overdraft problem. That will likely include some form of metering and monitoring. Schmidt said farmers might be on board. "If it could be done in a way that's for information and collect data to see what's needed to be done, I think we'd be behind that," he said. Cobb knows there's a fight ahead if — or, she hopes, when — someone tells these farms to stop using so much water. "Until we got a hold on our groundwater here in Arizona, it's futile to think you can just take whatever you want and you'll be fine," she said. She seems ready for it. "I don't like 'no,'" she said. "'No' is not an option for me."